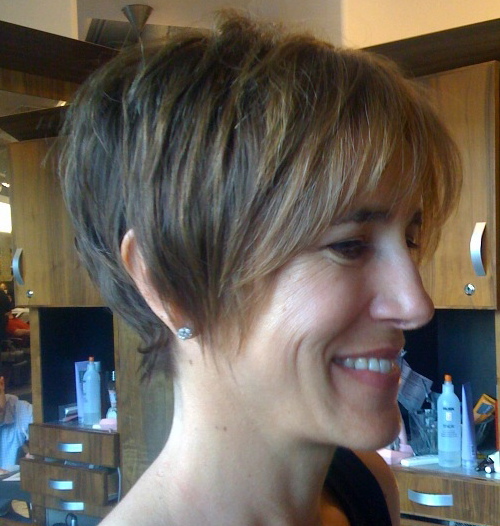 susan is looking remarkable in this short, fun and flirty cropped cut. her fine texture, natural wave, and beautiful bone structure make this a perfect option for her. susan’s hair was lowlighted with two different shades of brown making the ‘lighter’ hair through her ends looking more like highlights rather than faded. susan’s hair was finished with wired by rusk and polished with deepshine phytomarine lusterizer. you’re looking oh-so ‘sienna miller’, susan! Next Post testimonial from jamie b.